The R-PLEX Human Albumin Antibody Set includes a matched capture and detection antibody pair and calibrator for the quick and easy measurement of Albumin in biological samples. R-PLEX products leverage MSD’s electrochemiluminescence technology for better sensitivity and a larger dynamic range than traditional ELISAs. R-PLEX matched antibody sets enable the development of singleplex and multiplex immunoassays. Individual assays may be developed using MSD avidin- or streptavidin-coated plates. Custom multiplex assays with any combination of R-PLEX analytes, as well as R-PLEX plus U-PLEX analytes can be developed on U-PLEX MULTI-SPOT plates. To learn more about the advantages of R-PLEX products click here. 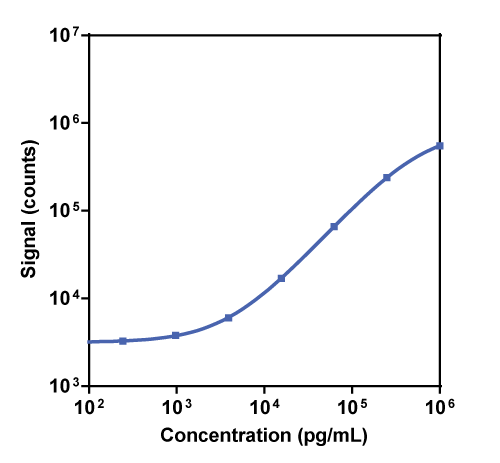 Calibration curve for the R-PLEX Human Albumin Antibody Set was assessed and representative data are presented below. Description - Albumin (serum albumin, HSA) is the most abundant protein in serum (50–60% of total serum protein). It regulates osmotic pressure and plasma pH. Albumin binds and transports hemin, fatty acids, hormones, and various cations. Approximately 80% of plasma zinc is bound to albumin. Albumin is produced in the liver and secreted into the bloodstream. It also has broad esterase activity. Damage to the kidney can lead to albuminuria. Increased albumin in serum may be due to exogenous anabolic steroids, androgens, growth hormone, and/or insulin.